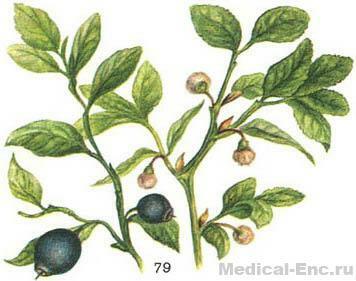 Bilberry (Vaccinium myrtillus L.) is a wild plant. Contains tanning substances. Infusion or decoction of berries (1-2 teaspoon on 1 glass of boiled water) is used as an astringent when diarrhea; is part of gastric teas. Fig. 79. Bilberry (right - branch with flowers). Spruce, ginger and blueberries - inseparable friends. So, look for this semishrub in the pine and spruce forest. For berry need to go in July - August. To collect in dry weather, in the morning, only the sun dew will dried or at the end of the day. Pluck blackberries carefully, without stalks. It's best to pick berries in a small basket or buckets. Soft containers for collection of blueberries unusable. Some like to comb berries with a special comb scoop. Of course, it's faster, but it is very harmful to the bushes. Blueberries are very useful, are considered to be the perfect medicine. In their purple pulp many different acids, pectin, vitamins C, a, b, tannins, iron, manganese. Blueberry improves vision, and dried indispensable as an astringent. Medical and blueberry leaves. Infusions and decoctions of them can help with diabetes, and gout. Collected berries cleanse from mosses, pine needles, branches. Wash them not. It is best to dry berries of a bilberry in the dryers, first podsalivaya them within 2 to 3 hours at a temperature of 35-40 degrees then gouseva at the temperature of 55-60 degrees. In good weather berries can be dried in the sun, rassypaev their thin layer, in 1 - 2 cm, on a bed of fabric or paper somewhere on the roof, attic or on the racks. In some areas berries dried in Russian furnaces. Well dried berries - strongly wrinkled, do not stain the hands and not slipping into dense clumps.